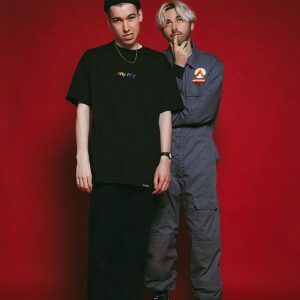 With a distinct sound, crowd engagement like no other and theatrics that create a feel much like that of Bowie or other cult musicians, Bad Sounds are beginning to cement themselves as a firm jewel in the crown of up and coming UK Indie Music. Recently they performed in their home town of Bristol and Benny Wu and I were lucky enough to experience this instalment of their ‘Get Better Movement’. The stage opened with two very talented warm up acts: Dylan Cartlidge and Indoor Pets and once both of their sets had finished, we were left eagerly awaiting the main show. Bad Sounds set opened with a very minimalist sketch of a lone light bulb flashing on stage accompanied by a voice booming through the speakers explaining how we would leave the gig as ‘good people’ and it was their aim to help us ‘get better’. This was very in keeping with the general essence and charm of their debut album “Get Better’ and so the show started. Opening with such a well-loved song like ‘Wages’ was the perfect choice as the crowd cheered and danced throughout, when it comes to this band, the audience atmosphere seems just as important as the set they are playing. Dressed in their classic ‘Get Better’ overalls the band continued reeling off hit after hit from their album with songs such as ‘Evil Powers’ and ‘Couldn’t Give It Away’ among others. We were then treated with a short interval with another get better speech as well as a costume change for the band, this time losing the overalls and donning clothes from an array of their music videos. The fans screamed as Bad Sounds treated the second half playing one of their older hits ‘Meat on My Bones’. They continued with an incredible set eventually ending with the perfect final song ‘No Luck’ and, as the front runner brothers Ewan and Callum wrestled around on-stage, confetti and balloons covered the crowd and the show came to a triumphant close. This might have been the best gig I’ve ever been to and anyone that cares at all about this band would be greatly missing out if they did not see them live. Great review! I have personally not listened to Bad Sounds before, but I’ll be sure to take some time to listen to them now after reading your article, it feels as though I’ve already been to their concert! !